Upper Eden is true to its name; a place of peace and unspoilt natural beauty. We have the best of both worlds: lying between the Lake District peaks and the Yorkshire Dales, our fields and fells combine grand mountain scenery with pastoral valleys and a proud agricultural heritage. 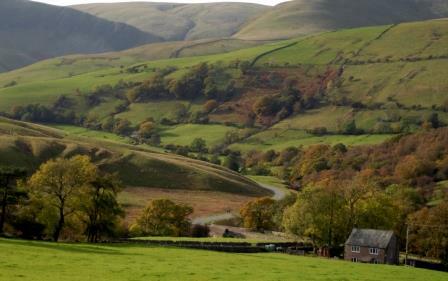 Part of our area lies within the North Pennines Area of Outstanding Natural Beauty. The Eden, one of England’s cleanest rivers, rises in the wilds of Mallerstang and flows to the sea near Carlisle, carving gentle valleys and dramatic gorges through the beautiful countryside. The landscape bears the imprint of history, from Neolithic times onwards, and traces of an industrial past, too, in the lime kilns and disused mine workings which burrow into the hills. The railway was important here: the world famous Settle to Carlisle railway criss crosses the river Eden and the now defunct Stainmore Railway has bequeathed viaducts offering lovely walks and spectacular views. Havens for wildlife abound in this unspoilt landscape, from traditional hay meadows to nature reserves and of course the river Eden. You will find red squirrels, rare butterflies and wildflowers, and a rich variety of bird life. Take the time to discover the magnificent scenery and wildlife of Upper Eden and find a place to breathe and space to roam.